2019 sees an overriding theme of sustainability and natural materials in interior design. For spring interiors, this means a preference towards long-lasting, classic styles, instead of bold looks that tire quickly. We’ve pulled together some trends to consider for your home, each echoing a timeless feel that won’t be out of fashion anytime soon. Spring this year comes with a big splash of colour – with some very interesting shades to consider for your home’s interior style. Whether you’re thinking of re-doing your entire house, or just a few select rooms. These wow-worthy shades could transform your home. That’s right, pastels are making a comeback, but not in the sickly-sweet way you might remember them. Instead, in the understated yet classic style that you won’t tire of. 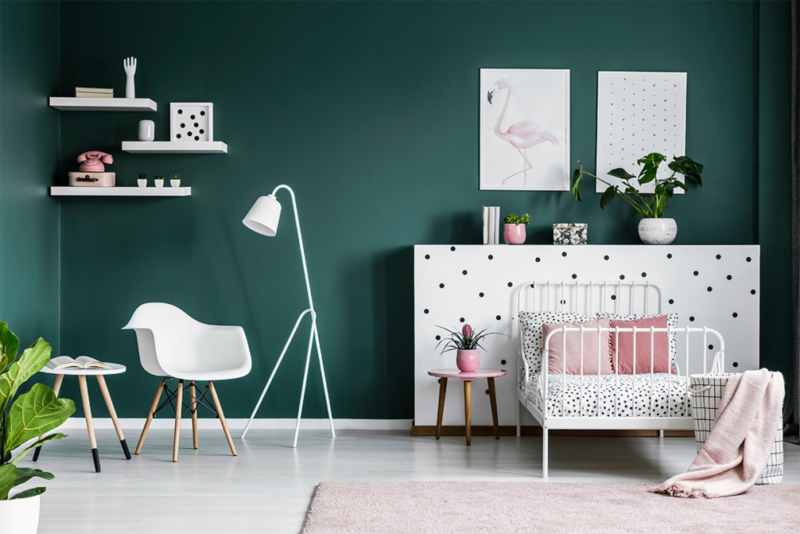 Muted pastels create the perfect minimalist backdrop for any gender-neutral room, be that a nursery, bathroom or kitchen. Utilising the soft pastels will create a light and airy space in these rooms, perfect for enhancing a relaxed atmosphere. From muted to moody. We’ve seen a recent rise in interior designers encompassing dark colours onto the walls of larger, well-lit rooms. This creates a cosiness, even in bigger spaces, as well as a cool ambience. This style is perfect for your main bedroom, or perhaps if you’re feeling brave, these dark tones could be introduced to your living room. House plants, the once seemingly quite retro element to any home, have been making a comeback in recent years. From small succulents to charismatic cheese plants, introducing greenery to your home creates a completely different vibe. Plants breathe life into your home, so encompassing them into your interior design plan is a decision we’re all on board with. Space dependent, include a plant in each room of your home and notice the transformation it makes to the overall style. Think about your choice of planters too. Encompassing natural materials such as concrete could be a good move here, as the boldness of the green will bounce perfectly off the industrial greys of the concrete. You could also think about some metal frame plant stands if you want to elevate that industrial vibe. Keeping in line with sustainable chic, inviting interesting textures into the home is proving to be a big hit this spring. 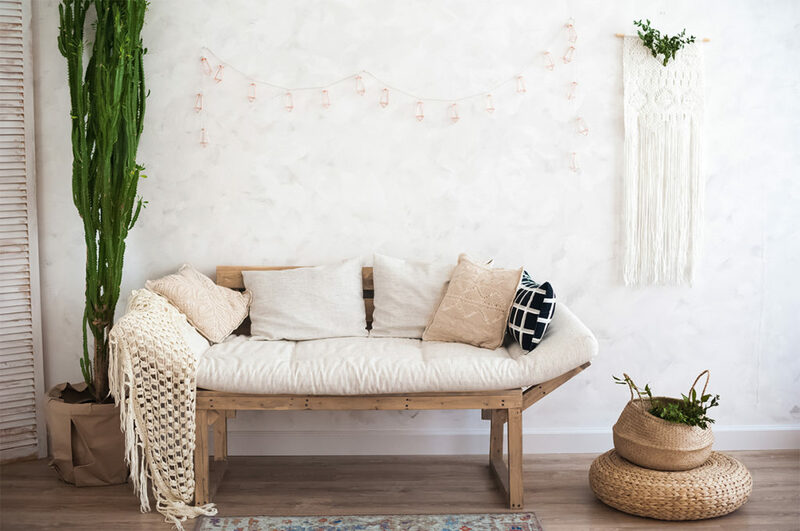 Gone are the days of simply having a couple of comfy cushions and a throw to snuggle up in, it’s now much more about the au natural look you’re trying to create for your home. Staying under the umbrella of sustainability for 2019 comes with a certain rustic aesthetic. This includes textures such as linen, hand-finished silks and cotton. Tasselled rugs are also a great addition to your home if you want to continue that rustic look and feel. By introducing neutral tones it will allow your space to be versatile when it comes to wall colour, so you can hold on to your textiles for longer. An interesting trend that is set to kick off for spring and summer 2019. This is all about natural, intriguing patterns within materials, inspired by nature. Pleats and plissé styles come into play here, exhuming an air of class whilst being wholly sustainable.